Personally I like them.. Although I use them so infrequently that I rarely use them well.. The areas I shop don’t tend to have a though put which could justify it, I think it’s all about getting the existing staff to process more low volume customers. Although I have seen some people who were quick at the counters. I hate these things. What an insult – they’re so greedy they cannot even be bothered serving their customers anymore. I refuse to use them, end of story. Perhaps if they offered a discount for saved labour, I might be tempted. But for as long as the groceries remain the same price, I choose the human cashier. I am glad Coles have not introduced these (yet). I always use it, and I have managed to avoid having the annoying robot woman complain. They still have to come and check the credit card signature though. @Adam, I thought Coles had trialled them in some areas some time ago, but maybe they’re not currently using them in a big way. @enno, it’s worth getting a PIN for your credit card I reckon. Saves time even at the human checkouts. I’ve only ever used them at Big W as our local Safeway and Coles don’t have self service. Actually, our local Coles probably has the best checkout service I’ve experienced. There’s always at least 2 checkouts open, even at 8am and on Saturday afternoon there’s at least 6 open. And this Coles used to be a small IGA. The Safeway on the other hand is enormous and usually has 2 checkouts open so I don’t lose sleep over the ‘lost jobs’ if there aren’t actually any jobs to lose. The Coles at Melbourne Central (just outside the main station gates) has about 9 or a dozen self-serve checkouts iirc, as well as a bunch of normal ones. Coles just installed them at Queanbeyan in the last few weeks. I used them tonight to buy apples and salad greens. I had no problem whatsoever with the machines, and I certainly appreciate the option to not wait in a queue. They are long overdue IMHO. Of course, I’ll still use Aldi for most of my shopping. Despite not having any self-serve checkouts, Aldi is still significantly cheaper than Coles or Woolworths. It would be nice if self checkout included a discount of say 1% off your grocery bill. They’d still be more expensive than Aldi, but it’d set an appropriate precedent. Disclaimer: I used to work for NCR, albeit in an entirely separate division of the company to the people that sell Self-Serve checkouts to retailers. 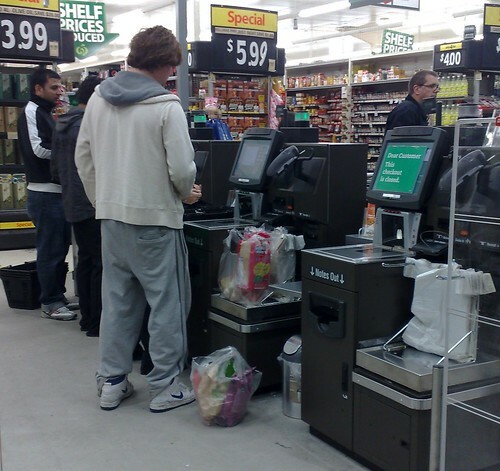 I prefer to use the self-service checkouts at my local Woolworths. I know how the machines work (until they upgrade the firmware again, then I need to re-learn it), and I can check out about as fast as the human operators. I also have absolutely no qualms about dumping large numbers of coins into the machine either when I have them on hand. I tend to carry around a large backpack with a laptop and camera gear in it – and staff at Woolworths are almost always (well over half) asking to look in the bag, which is inconvenient. Only once had that happen with self service – probably because I was buying under $15 worth of stuff. Then again, I’m now doing a large amount of my fresh food shopping at Harris Farm Markets, which are on my way home from work – they don’t have self serve, but the quality is great, and staff fantastic. They are ok for a couple of things, and as you say if there are long queues. I clicked the wrong vegetable button once and there was no way to cancel it, so I picked my goods up and restarted at another self serve check out, leaving the first one hanging, and then escaped quickly. I use the self-service checkouts almost exclusively, and I go to Donvale Coles rather than Doncaster East Safeway even though the latter is closer just because the Coles has self-service checkouts. The major reason is that a trip to the supermarket is one of the few times that I actually get five minutes to myself, and so I kinda like it if it goes slow as I get to be out just a little longer. Not to mention not having to talk to a human! Man, some people are antisocial! I love making idle small talk with the person at the checkout. In fact, at places with multiple queues I’ll choose my checkout by based on how friendly the staffer is! Unfortunately my local Woolies and Coles use a single queue for all checkouts, so I can’t use that strategy there. I love those self serve checkouts because it saves time and energy but they take jobs away. It does not have room in the bagging area for big things like loo paper. Coles at Chadstone has it. In Aldi I hate paying for bags and same with Target. I don’t really mind them at all. Although, I virtually never buy more than 8-10 items. Beyond that, I did put through a trolley-full with partner and needed 4-5 ‘staff interventions’. I’m the same as Vas. Love the small-talk and will look for the chattier operators. On the other hand, we are no longer in the industrial age, and I don’t know why companies would be expected to hire staff for a manual job that a computer can easily do. Although it’s not really any more automated. I’m still happy to scan it through rather than stand there and watch a young teenage girl lift a canvas bag that is 4x too heavy for her. I used the self-serve checkout at Big W in the city at lunchtime, and the item I was scanning was priced higher than advertised. The only problem was, I didn’t work it out until after the transaction had gone through. At the time, there weren’t enough staff on board so I had a lot of difficulty finding someone to help me. When I finally found someone, I was treated like a shoplifter. I had to tell my story to about 4 different people who didn’t know what to do with me, and was finally sent to the returns desk where i was given a refund and it was manually put through at the right price. I would say it took about 10 times longer than if I’d waited in line with a person. I’ll never use them now. Once bitten. i love it! after youve done it a couple of times to get the hang of it, its a million times faster! and i hate when they pack cleaning products with meat … i ALWAYS pack my own bags! I don’t like the feeling of going up to the cashier, even in the express one when all I’ve got is a single item, like a drink, or just a couple of things. Hence self serve wins for that. I haven’t found them too hard to use. I only use it if I have only a few things and I haven’t brought my cart/jeep/ trolley with me, and the lines elsewhere are long. Self-checkouts can’t cope with large amounts of stuff, because there’s little room to unpack to, and in my case the “to” and “from” are both my cart and it has to be empty before I start packing things away after they’re scanned – so I can’t just let them accumulate on the floor on either side of the scanner. I live at Craigieburn and they have a Woolworths with expenses and crowds due to population of more than 20 000. I never go there unless I am desperate for something. I go to Woolworths at Roxburgh Park or Coles or Aldi at Broadmeadows. Cheap at better brands at Coles and Aldi. Love em. I don’t like them either and I never used them. I think it’s a great insult to other people who are unemployed and in need of a job. To think they they are now replaced by machines. And as a consumer, I’d expect service not a machine I have to figure out how to use. Don’t use them for the first time with 15 items, its like anything, start slow, buy a drink or something first. Also they are so imperfect that they wont replace the normal register for trolley loads or anything. And honestly, if you ever feel like you’re being forced to use them and really don’t want to, stay in line, even if there’s 10 people in front of you, watch how fast the additional registers get opened. Just don’t do what one customer did at my store, which was to spend six months every time he was in yelling at customers and staff about how they were stealing jobs, they may well be but he was yelling at the wrong people. Also “Vas”. the idle chit chat you think is social with the register operator, that’s a conversation your paying for, it’s not social, it’s staff being polite because it’s part of their job. Not to say its not appreciated when customers are friendly and do more than grunt hello at you and wait to give you money, but that’s usually the norm. There just isn’t a enough space to stack your stuff if you have a full trolley load and you end up all over the floor and in other’s way. I think I was closer to losing it that day than I have for a long time! All things being equal, I’ll take a human operator – for all the reasons you nominate. The first dozen times I used self-checkout something went wrong. Now I’m adverse to using them unless desperate – long queues, small amount of clearly bar-coded stuff to buy, nothing too light or bulky, etc.